What Are the Benefits of Sprouted Wheat Bread? So Is Sprouted Wheat Bread a Better Choice? A lot of people are turning to healthier food options and some training programs also ask the followers to include such products in their diet. Sprouted grain bread instead of regular ones is one of the good options. However, before you turn to it, it is important to know what it exactly is and whether you should switch to this option. Grain is the seed of certain plant. There are three edible parts of the whole grain: the germ, endosperm and bran. When grains are sown in the soil, they germinate and grow into a new seed-producing plant. However, if you harvest the grain before it turns into an actually new plant, you will get sprouted grain. People believe that the grains that are between a seed and a new plant have more nutritional content that is higher than regular grains because the process of sprouting will release all the crucial nutrients in the grain. Given below are the details of white bread and whole wheat bread to help you understand the differences between them and sprouted bread. White Wheat Bread: For making white bread, the germ and bran layer of the wheat are removed. Only the endosperm is ground into flour, which is then used to bake the bread. The germ and barn contain the nutrients which are removed in this process. Whole Wheat Bread: In this type of bread, the entire wheat grain is used to grind into whole-wheat flour which is then baked into whole-wheat bread. This bread has more fiber, vitamins and proteins. Due to the process of sprouting, the protein content in sprouted wheat bread is higher and fat content is lower as compared to other breads. Department of Agriculture has done an analysis which states that when sprouted, grains contain 75% carbohydrates as compared to whole grains. The fat content is only 40% of whole grains but have little more protein. Besides, sprouted wheat breads are easy to digest since the starch is broken down during the process of sprouting into simple sugars. Gluten-sensitive people also benefit from eating sprouted wheat bread, because it contains lesser gluten content. However, since it is not completely gluten-free, it cannot be consumed by patients of Celiac disease and people allergic to gluten. 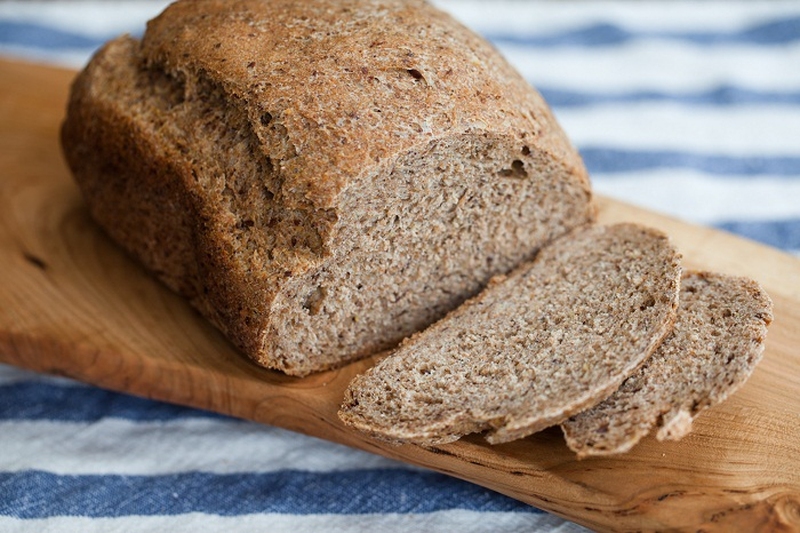 Since they are so healthy, why not take the option of baking sprouted wheat bread at home? Click here to follow a recipe here or just watch the video below to learn it. Note: When making the sprouted wheat bread at home, you might not be successful in the first attempt. You should keep trying. The sprouting process and time taken for it is crucial and difficult. The sprouts might be ready to be used before you are ready to bake and vice versa. If this happens, the sprouts can be used in salads or some side dishes. If you compare the nutritional profile of the sprouted wheat bread with that of white bread, it is obvious the former is a better option. Since the former has higher protein, vitamin and mineral contents. However, when the sprouted wheat bread is being baked, it will lose some of its nutritive value. The nutritional content, especially protein, is similar in whole wheat bread and sprouted wheat bread. But still, the latter is a better option for vegetarians. This is because sprouted wheat bread will provide complete proteins that they won't get from eating meat.